There was relief for Irish holidaymakers last night as the French air traffic control strike was called off. Flights are returning to normal for Irish travellers today with the possibilty of some delays as the backlog clears. The news came too late for thousands of Irish passengers whose flights were cancelled during industrial action over the past two days. Ryanair said the strike had been cancelled and all its scheduled flights would operate as normal. “ All booked customers should proceed to the departure airport as normal,” the airline said. 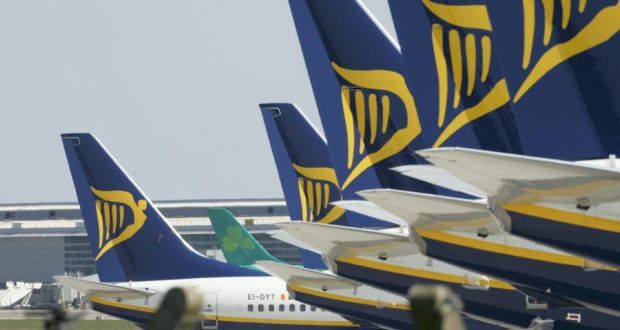 Ryanair spokesman Robin Kiely told Newstalk Radio said there were “some delays in France” today as the backlog cleared but the airline had no cancellations. The strike over planned cuts had been due to continue into the weekend. It ended after talks because the French government recognised the “importance of investment in the sector,” French news agency AFP quoted the Unsa-ICNA union as saying. The Belgian air traffic control strike has also ended. Belgian air traffic controllers went on an intermittent strike for two hours last evening and betwen 2am and 4am this morning. However Aer Lingus said it had been informed that the industrial action inBelgium had concluded . Aer Lingus said it plans to operate a full schedule today but customers could expect some delays on flights to and from the Iberian Peninsula and France. It urged customers to check the status of their flights online before travelling..
Dublin Airport expects flights to operate as normal today but advised concerned passengers to consult their airline’s website. Most of the Irish flights cancelled yesterday were operated by Ryanair, which was forced to cancel at least 25 flights between Ireland and France, Spain and Portugal. Aer Lingus did not cancel any flights yesterday but passengers experienced delays of up to two hours. At least eight Aer Lingus flights into Dublin today were delayed by an hour or more, including flights from Brussels, Malaga, Napoli, Geneva, Barcelona, Nice, Paris and Lyon. Ryanair cancelled about 15 per cent (more than 260) of its 1,600 flights across Europe today due to the Belgian and French strikes. Ryanair cancelled flights yesterday on routes such as Dublin to Malaga, Carcassonne, Biarritz , Girona, Lisbon, La Rochelle and Paris. Services between Cork and Mallorca, Bordeaux, Algarve and Shannon to Alicante were also affected. At the Ryanair customer service desk in Dublin Airport yesterday afternoon there was no queue and an air of calm. However, several blue Ryanair screens at check-in desks read “cancelled”. Many passengers at the airport told The Irish Times they were relieved not to have been affected. Ryanair said all customers affected by cancellations will be offered reaccommodation on later flights or full refunds. The strikers, attached to the Unsa-ICNA union, were protesting against planned cuts that they say would harm air traffic control services in France. Ryanair has called on the European Commission to remove the right to strike from Europe’s air traffic controllers, who it said were “attempting to blackmail ordinary consumers with strikes”. The company said many of Europe’s police forces and army personnel were not allowed to strike. Nor were air traffic controllers in the United States, “meaning the skies over the US cannot be closed or severely disrupted by air traffic control strikes or work to rule”.